Spotify has been on my business model watch list for some years. They constantly leverage partnerships to build next steps for developing their business model and achieving growth. In this article, I wanted to take a closer look at some of the partnerships that Spotify has created. How does the business utilize these partnerships? To what extent are these partnerships successful? Do they contribute to a cohesive user/customer experience, or is Spotify turning its product into an attribute soup? Many people, including myself, know and love Spotify, the online music streaming service from Sweden. Initially Spotify was only available in Scandinavia. They expanded to more countries whenever they could obtain licenses for streaming music. These licenses are terribly laborious to obtain, as each country has its own systems and process for agreeing on the terms for broadcasting. In the early days of the company, Spotify’s priority appeared to be to get enough coverage geographically, working hard to obtain license deals. But now that they have achieved coverage, they’re dealing with other growing pains. Spotify has a sizable body of listeners, about 50 million. Of those 50 million, 12,5 million are paid subscribers. These are also the company’s main source of revenue. But with increasing competition from services like Apple’s upcoming Apple Music platform, Rhapsody, Rdio, and even Youtube, Spotify is on a mission to onboard more users, and to increase the rate at which they can convince free users to convert to a paid premium subscription to the service. Within this business landscape, Spotify is clearly opting for the partnership model to compete. Just a sample from the list shows partnership collaborations ranging from Coca-Cola, to Bang & Olufsen, to Uber. However, these partnerships are strikingly diverse. You wonder what the overall strategic rationale would be. To better understand Spotify’s partnership-driven strategy, I’ve selected a couple of interesting partnerships for closer examination. Firstly we’ll look at Spotify’s deal with Facebook, because Spotify utilized this partnership to enter the US market (where it was completely unknown, before entry). Secondly, we’ll have a look at Spotify’s deal with Bandpage, a social media integration site for artists to engage more with their fans. Lastly, I’ll speculate about the recently announced partnership with Starbucks, a very interesting move, blending value from 2 seemingly disparate industries, each operating with their own clock speed. Does the partnership contribute to Spotify’s current strategic challenge to on-board more users, and increase the rate of conversion to premium subscriptions? Are these partnerships an equally compelling proposition to Spotify’s partners? As I mentioned in the beginning of this article, Spotify was initially active in the European markets. However, they didn’t have any directly addressable market in the US. Nobody knew them when they wanted to enter the US in 2011. Instead of going for a widespread advertising campaign, Spotify opted for a leaner approach by using Facebook’s channels to land in the US. The design of this partnership is as follows. Spotify has its eyes on Facebook’s main asset: Facebook.com and its users. Spotify’s offer is to leverage this channel with shareable streaming music content. This way, Spotify offers its unique resource of music licenses, which were painstakingly won on a country-by-country expansion basis, as a proposition to leverage Facebook’s social networking proposition to its customers. To ensure mutual accessibility to these value elements, Spotify and Facebook have jointly created a music streaming API to stream, and share Spotify-powered tunes within Facebook. This value exchange creates a new channel for Spotify, where its app is displayed prominently on the Facebook user’s dashboard. For Facebook this exchange creates an addition to its value proposition by offering legally shareable music on the social network, something that would have taken them ages to attain by themselves. This sharability additionally boosts Spotify’s presence by creating viral network effects to expand its reach to new users. The hypothesis for Spotify is that the Facebook channel, in combination with the network sharing effects, will provide it with exposure in the US, and lead to new sign-ups. The focus is mostly on acquiring new users. The partnership design doesn’t address the deepening of engagement with these users to increase the likelihood that they will convert to a premium subscription. For Facebook the hypothesis is more complex. The music streaming service value proposition firstly has to increase user engagement with the platform. In turn, this engagement must then lead to new user behavior data, which would increase granularity for targeting advertisement campaigns for Facebook’s main source of income: advertisers. As for the objective on obtaining more users, this partnership was a very successful partnership for Spotify, because they successfully entered a new market in the quickest way possible. Their current presence in the US market validates their partnership hypothesis. The fact the partnership is still active to date, is an indication that it is also creating value for Facebook. The context for this partnership is compelling. Spotify has been under fire from several artists like Radiohead’s Thom Yorke, and Taylor Swift about the rewards they obtain from providing their work on the Spotify platform. As a response, Spotify was compelled to search for new opportunities to add more value to their relation with music “suppliers”. They saw an opportunity to make this happen in a partnership with Bandpage. Bandpage is an online service that integrates an artist’s social media presence. Artists are able to integrally update news on their tours, and availability of merchandise from their sites, to a wide range of media channels, like Facebook, Twitter, Xbox, and in turn increase engagement with their fans. Could this partnership solve Spotify’s issues with artists, and at the same time increase user engagement with its platform? What Spotify desires from Bandpage is the convenient link it provides to the artist’s own media campaigns. Spotify would be able obtain all their artists’ campaign content through a single aggregator, instead of having to source it from each artist individually. To leverage this asset, Spotify offers the artist’s Spotify profile page, and their (playable) discography (again employing the licenses it has to artists’ music content) as a means of targeting promotional campaigns. To ensure mutual access to the value that these partners bring to the table, Spotify has created the ability to integrate Bandpage’s content stream into the artist’s Spotify profile. Artists can opt-in to this feature by linking their Bandpage and Spotify accounts. The value this creates for Spotify is the ability to offer instant updates to a highly targeted audience of artist fans. This is a value proposition to both fans using Spotify, as well as to artists. Interestingly this expands the role of the artists in Spotify’s business model. They move from being a supplier at first, to also being a customer to the Spotify platform through the partnership. For Bandpage, this partnership fits into their overall partnership strategy to link up with as many relevant social media channels as possible. The added benefit in partnering with Spotify is the highly targeted channel to fans. For Spotify the partnership creates a new value proposition for a new customer segment, namely artists. To find out how this proposition would play out, Spotify would need to test the hypothesis that this campaign positioning will convert to a significant increase in traffic to the artist’s site, thereby stifling their criticism on the lack of value Spotify creates for them. For Bandpage this partnership will create a new channel via the Spotify platform. The main hypothesis I would test, is whether this very targeted channel to fans leads to a higher conversion rate in sales of the artists’ merchandise. The reason is that Bandpage’s revenue stream depends on sales taking place on the merchandise sold through the leads it creates with fans. Whether the partnership was able to validate these hypotheses is still not clear. From my own experience in using Spotify (a lot) and listening to a broad range of artists, I haven’t seen any artists that have used the Bandpage integration yet. If artists aren’t making use of the possibility to link their Spotify and Bandpage presence, it will also not create any additional engagement with fans. It’s thus likely that the partnership isn’t creating the value hoped for. On the other hand, the partnership doesn’t conflict with either of the partners’ business models, and it doesn’t cost either business anything. So it is could be that this partnership will be continued and improved upon. Yes, you read it right! Spotify and Starbucks recently announced a partnership. A music platform, and a coffee house are joining hands. This is a seemingly unlikely combination, but Starbucks does have a track record in providing music as part of its value proposition with its range of CD collections, and until recently its partnership with Apple’s iTunes. Although the partnership with Spotify is yet to be implemented, and both companies are secretive as to what their proposition will actually look like when they launch, we can speculate how it might play out for both partners by filling in some of the blanks from their press release. Spotify has some Starbucks assets on its list that it desires to have access to. Firstly, Starbucks has over 7.000 physical coffee shops, and 150.000 staffers on the ground. This is something Spotify doesn’t have. Secondly, Starbucks has a very successful loyalty program, which hosts about 10 million active members. To leverage these assets, Spotify can offer its streaming music service, to be used in the context of Starbucks’ physical stores. This is very interesting to Starbucks as they have no presence yet in the growing music streaming market. Secondly, Spotify has a group of premium subscribers of comparable size and geography to Starbucks’. Together, this could create an interesting community. To provide mutual access to these value elements, the partnership would create 2 types of transfer activities. Firstly, the partnership will integrate a Starbucks staff playlist feature into the Spotify app, so Starbucks staff can stream music in-store. Customers will also be able to vote/comment on these tracks to influence the music that is played. Secondly, Spotify and Starbucks will couple their respective premium accounts, and loyalty program. This creates the opportunity for combining forces to deepen customer relationships. For Spotify the partnership will create a new channel, where their platform is used in-store to provide for music. Also staff will be actively promoting their brand. Secondly, Spotify could offer Starbucks rewards for every increment in duration of a user’s premium membership with Spotify (but this is speculation). For Starbucks the partnership will mean that they’ll gain a prominent position on Spotify’s categories of playlists. This could give a significant boost to Starbucks’ online presence, and opportunities for people to engage more with the Starbucks’ brand. Secondly, the coupling of membership/subscriber accounts would enable Starbucks to hand out tokens for Spotify membership discounts in combination with their loyalty program points (again speculation). Of all the three cases, this partnership is the only one that has the potential for meeting both facets of Spotify’s strategic challenge. By having an in-store presence Spotify could expect more people to sign up for their service. On top of that, the link with the Starbucks loyalty program could incentivize these sign-ups to a premium membership, resulting in an improved rate of conversion! For Starbucks, the main hypothesis is that providing streaming music will enhance engagement with their existing loyalty program members, as well as increase the number of loyalty program members, by onboarding people from the Spotify platform. We’ll have to see if this partnership design will actually be implemented as described. But in any case, the combination of values between these two companies has great innovation potential to boost the customer experience. Now that the partnerships have been presented separately, the question remains whether Spotify’s business model is still cohesive. The portfolio overview of these selected partnerships is presented below. Overall they don’t overlap in terms of their market space. Also the partners don’t interfere with eachother in terms of brand identities. Spotify has figured out a way of positioning their partnerships discretely enough, so that they don’t interfere with user segments that don’t care for making use of what the partnerships have to offer. This is a good indication that the partnerships can co-exist within Spotify’s business model. Fig 4. Spotify’s partnerships with Facebook, Bandpage, and Starbucks. What’s also striking is that Spotify is very consistent in their partnership design. In each case, they seek for an opportunity to leverage their key resources: the music licenses. Even though Spotify might be dwarfed by the size of some of their partners, the asset of having these licenses brings enough to the table to be an equal partner in negotiations with the likes of Facebook and Starbucks. The Spotify partnership cases have been instrumental to show how the company experiments with partnerships to evolve its business model to compete. The $64.000 question remains what business model will prevail in the space of music streaming. Yes, Spotify and its streaming competitors might draw in a lot of free users, successfully pulling them from the paid downloads market. But the streaming industry is still struggling to find the business model to pull of the job of converting people to paid subscriptions. The key will be to keep experimenting with the value proposition and the customer experience. Spotify stands out in this respect. They’re approach to experiment through partnerships to find the right business model pattern stands out. Not only because they amplify their existing business model, but even more so because they are willing to utilise partnerships to reshape the building blocks in their business model. Spotify takes partnering to a whole new level. Money is not the critical factor in designing partnerships. A partnership is built on the combinations of value from both businesses, which don’t depend on paying each other for a service. As soon as money enters the discussion, you might be moving towards setting up a transaction, or to an investment relation. Those relations are very distinct from the partnership relation. The realm of partnership enables you and your partner to create value. The realm of your respective business models will determine whether you’re able to deliver and capture that value. A partnership only really works when the hypotheses for value creation (in the partnership) and capture (in the business model) are validated for both partners. Every partnership is only a hypothesis upon conception. Partnership hypotheses need to be tested, and most likely iterated. Therefore it makes a lot of sense to apply the lean startup build-measure-learn cycles to developing partnerships. A tool like the partnership canvas can help to communicate and consciously design experiments for testing together with your partner. 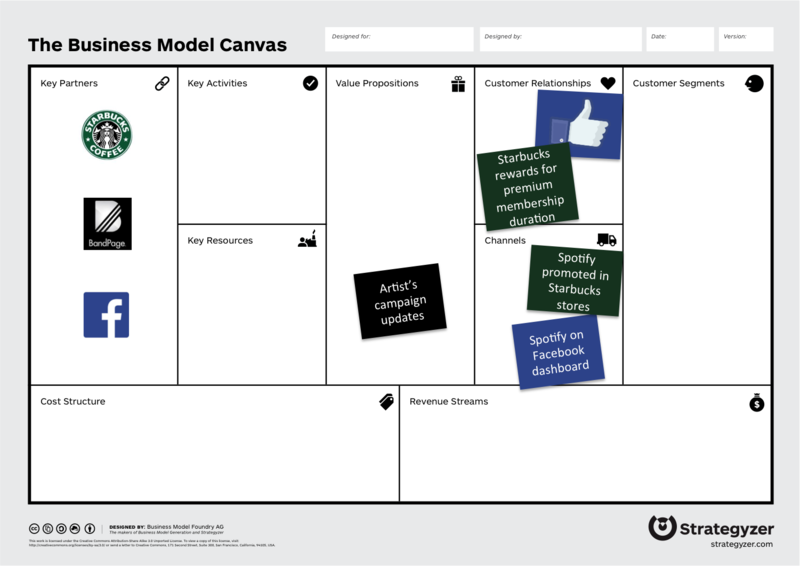 Use the partnership canvas for partnership portfolio design. Avoid loosing overview what partnerships contribute to your business model by being explicit about what each partnership contributes, how you test and monitor whether that works. Also prevent partners from getting into each other’s space by partnering with you, and make sure that you don’t mash up conflicting brand identities in your partnership portfolio. Interested to learn more about how Spotify reigns the world of partnerships? You can join the Partnership Design Linkedin group, or get a seat at one of our Partnership Design Masterclasses.